Easter is fast approaching (even though it seems like it's taking forever this year since it's so late!). 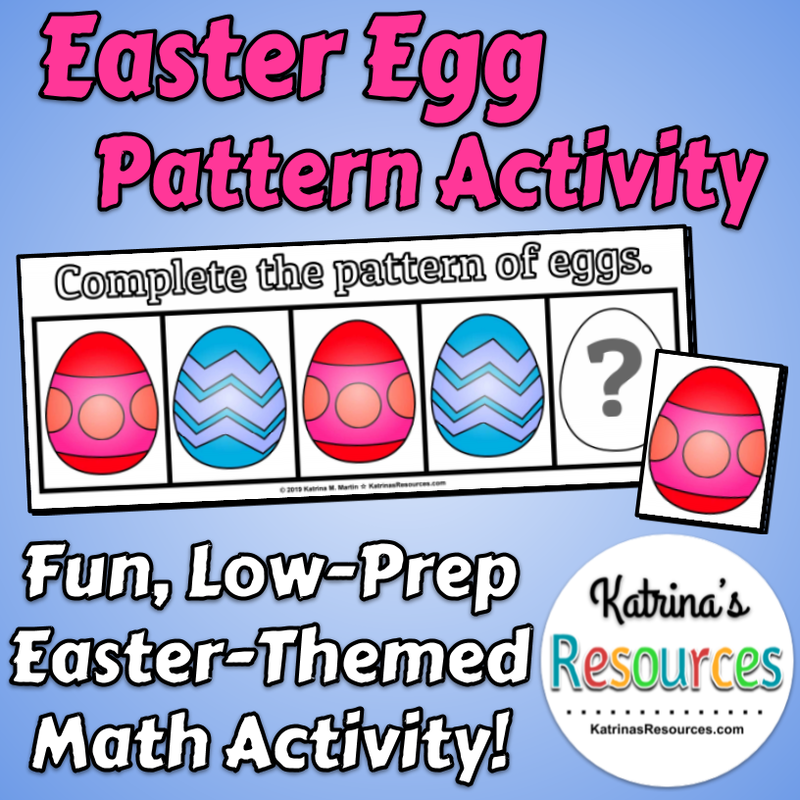 If you're not one of the schools that is already on spring break, you may be looking for some activities with an Easter theme to do with your students this week. 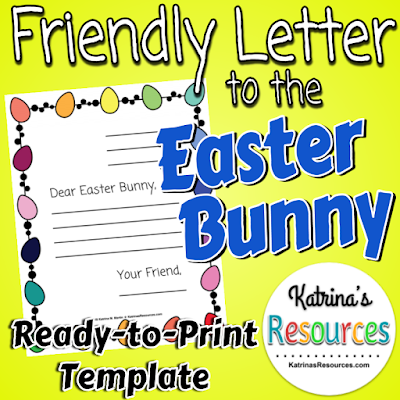 Check out some of the Easter products I have in my store today! 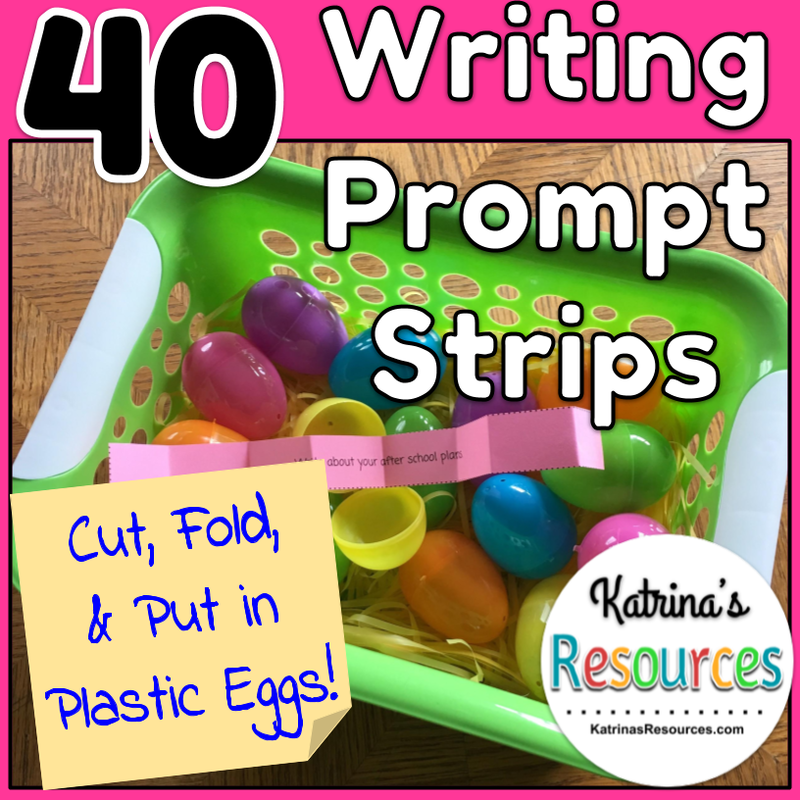 Although these are not Easter-themed writing prompts, they are written on strips so you can easily cut, fold, and put them in plastic Easter eggs (which are 0.99￠ for three dozen in stores right now!). 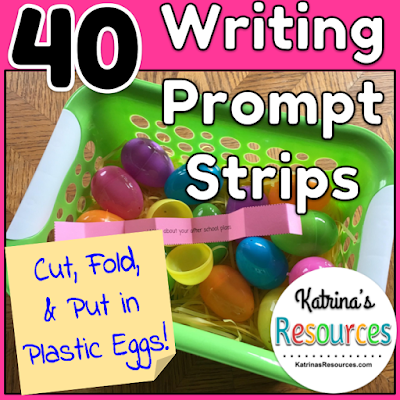 Hide them around the classroom for a fun Easter egg hunt that ends in your students writing or put them in a basket on your desk to switch up the way your students find inspiration to write. 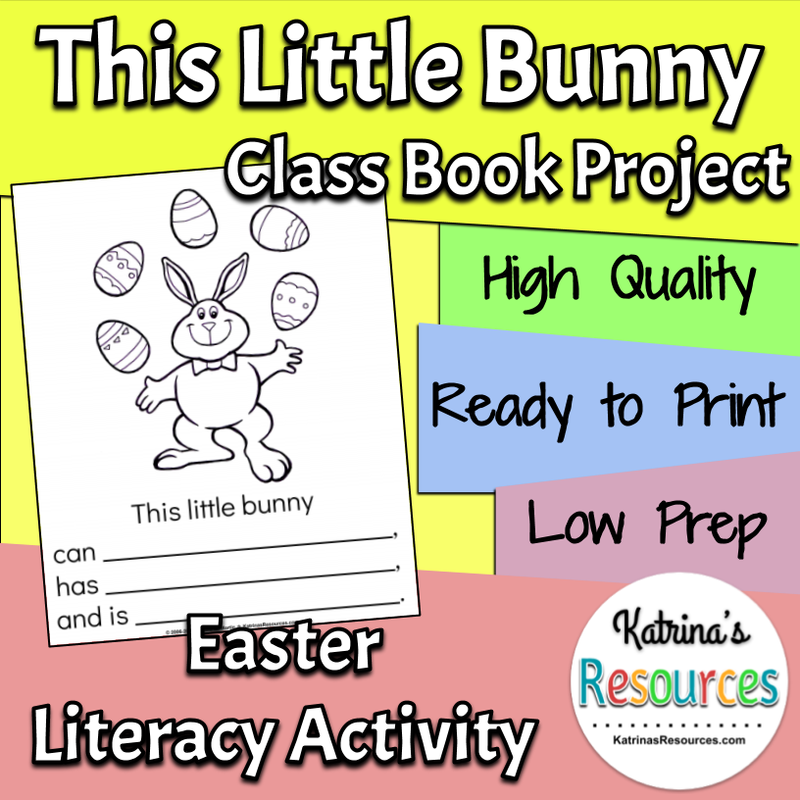 Want a quick literacy activity or maybe an independent reading center? 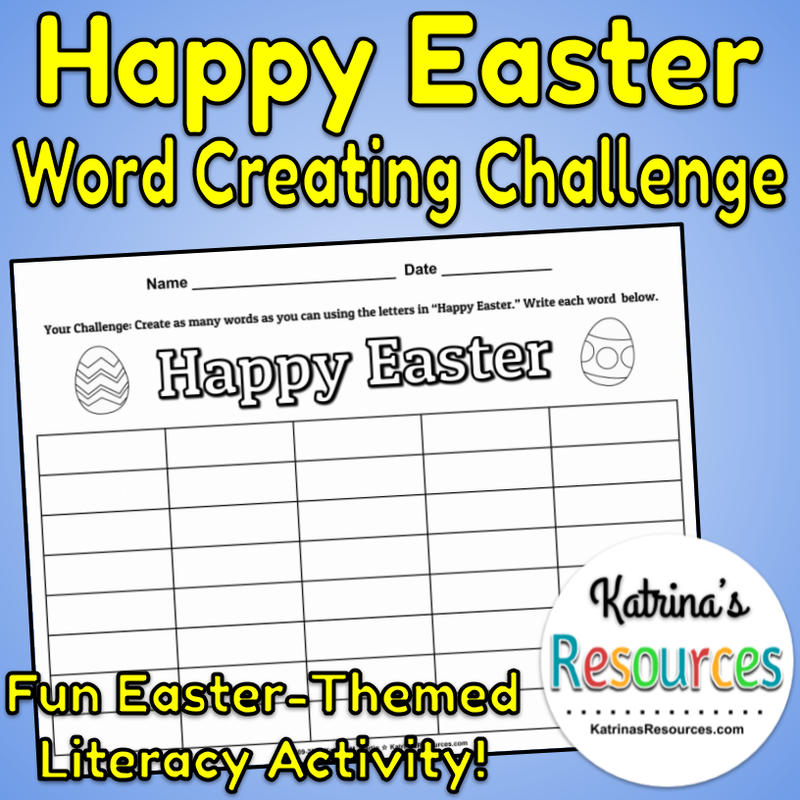 This ready-to-print activity has your students creating words based on the letters in "Happy Easter." 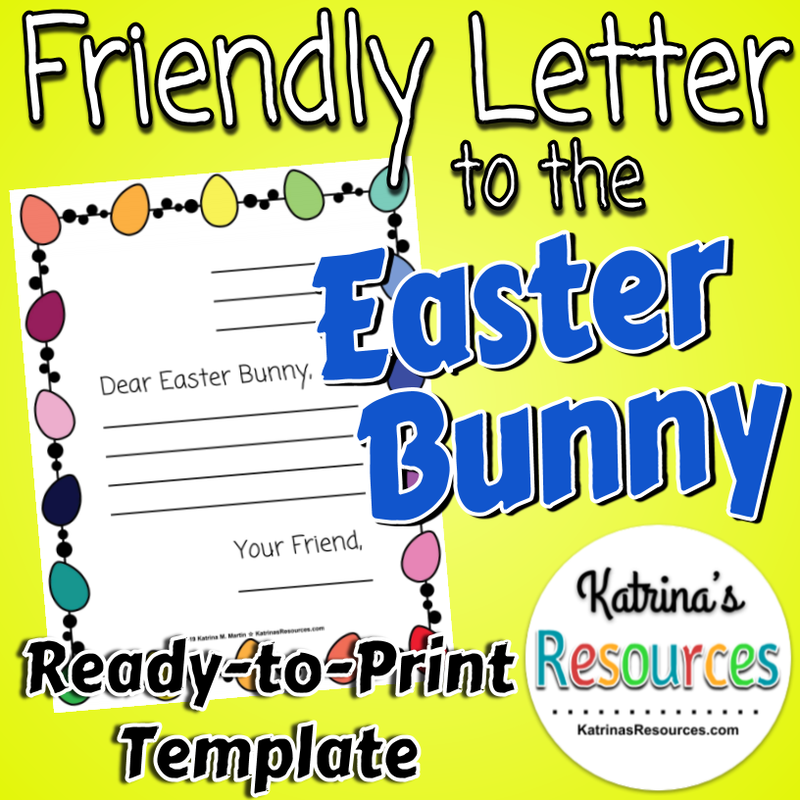 Use this ready-to-print template to have your students write a friendly letter to the Easter Bunny. 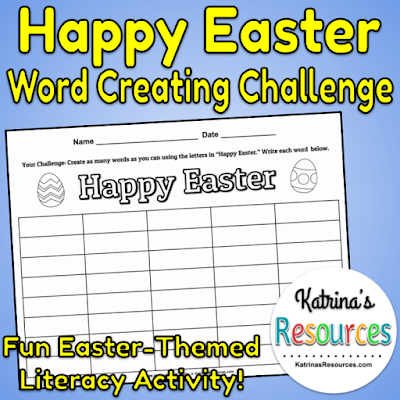 It gives them practice writing and is a festive activity to get them excited about what might be in their Easter basket this year. There are a few different versions with different sizes of lines so you have options based on your students' levels. 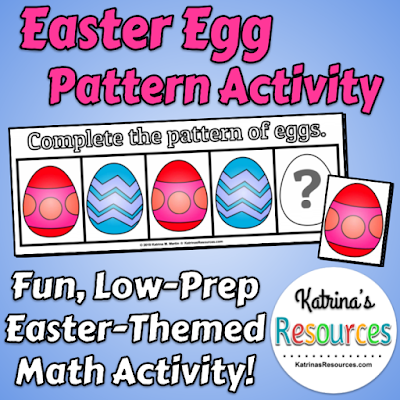 Switching gears to early math skills, this activity focuses on patterns of Easter egg designs. I recommend printing in full color and laminating for product longevity. 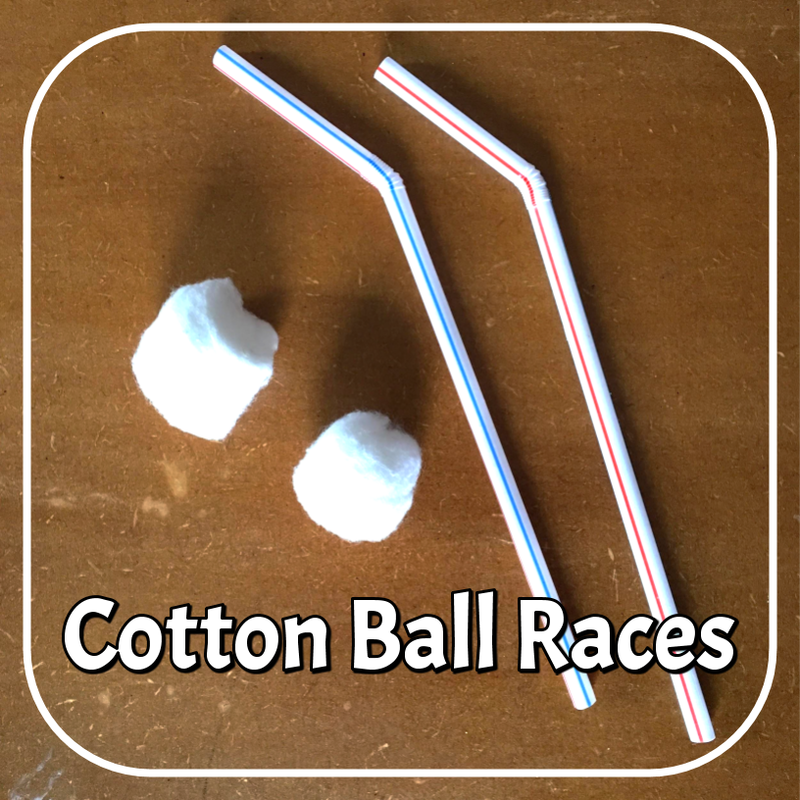 It makes a great center for a small group or something fun to do during indoor recess (if your weather is anything like ours here in Western New York right now, you don't have much of a chance to get outdoors!). Do you love making lists and checking off items? 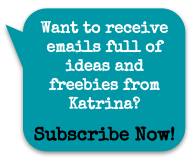 Do you strive to become more organized, but need a simple tool to help get started? 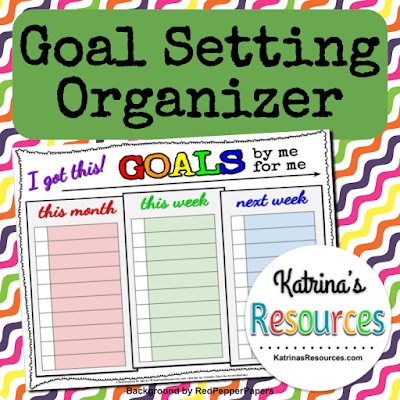 Do you like to keep track of weekly, monthly, and daily tasks you need to complete? I personally love making to-do lists. Writing down everything I want to accomplish in a given time frame really boosts my productivity and makes me feel proud when I've completed everything. I started using uniform lists (like the one below) to keep myself on track and thought others may benefit from them, too! There is space to write the dates, three weekly reminders, daily tasks that can be monitored all seven days of the week, and even a monthly check-in for big projects that you have in the works. I have found my productivity increase since I started making this a part of my weekly routine. 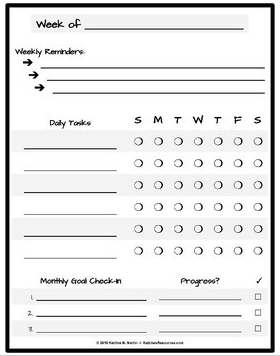 Want to check out this Daily Task Organizer? Visit my store today. And if you're interested in other resources to keep your life in order, be sure to check out the Organization Tools I have available now. I'm constantly adding new things, so check back often for more. 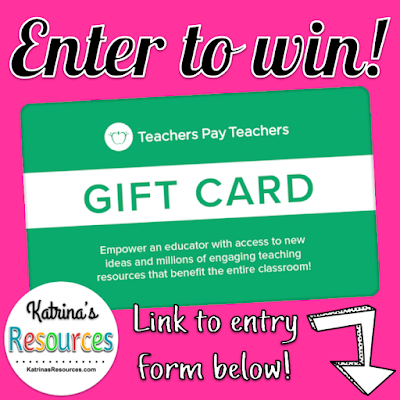 Just in time for the Teachers Pay Teachers sitewide sale, I have a gift card giveaway happening now! To enter, click here and complete the entry form for a chance to win! The winner will be notified by 5:00 PM EST on Tuesday, February 26, 2019 via the email address provided in the form. There is a site-wide sale on Teachers Pay Teachers coming up this Tuesday and Wednesday, February 26th and 27th! I will have everything in my store marked down, even my bundles! 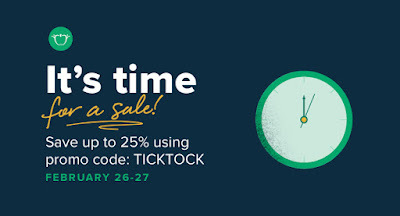 Use promo code TICKTOCK to save up to 25% off your favorite products. So ready those wish lists and check your budgets... It's a great time to figure out which products you can't live without this spring! If there's one thing that frustrates me more than anything else it's how inconvenient my motivation is. I am currently "free" to do whatever I want. I'm home with both boys, but they're both napping. And I have absolutely zero motivation or inspiration to do anything productive. When will I have the motivation, you wonder? But when I'm absolutely free to do whatever I want? When I'm caught up with housework and my boys are asleep and Nick is at work? Nope. I don't have the desire to do a thing. And it frustrates me to no end! At least I can vent through my words and hopefully spark some inspiration to accomplish something by doing some writing... We'll see! So if you know me, you know that I am extremely tech-savvy and quick to use digital resources in and out of the classroom. But I have to admit that I have a dirty little secret... I love neatly-organized, color-coded, three-ring binders... full of ACTUAL PAPER. I truly am embarrassed to admit that even though I am fully capable of utilizing most of my resources and materials digitally, there is nothing like a hard copy of a reference! But one of my absolute favorite things throughout my life has been making lists on paper. To-Do lists, shopping lists, Christmas lists, lists of goals I want to accomplish by the end of the month, lists of homework assignments I have to complete, lists of reasons why I was annoyed at my little brother (I was a very dramatic child haha). If there was a way I could use a narrow notepad and one of my favorite writing utensils, I'd find a way! So the fact that my list-building has gone digital lately is a big, BIG deal. If you're like me and you get the satisfaction of making a list and crossing out each item, but you're also trying to get with the 21st century digital age, then I have two tools you might love to try out! We have Echo Dots all over our home. They're SO convenient for turning our lights on and off, listening to our favorite tunes, getting the weather report, learning answers to random questions we have, and so much more... But one of my absolute favorite features is the ability to create lists. We have a shopping list that's always current, to-do lists, gift ideas for family members' birthdays or Christmas, lists for specific stores, etc. If we're out and about, we no longer have to stress about leaving our shopping list at home because it's always accessible through our Alexa App and we know if we needed something, we just told Alexa about it at home. I love all things Google (almost as much as I love all things Amazon... seriously, they are almost tied), so it's no surprise that I utilize as many tools and features in my Google apps waffle that I can. Google Tasks gets my to-do list organized in ways nothing else has been able to do before. I can create specific lists, add details and reminders, and check everything off when I'm done. It's as close to the satisfaction of crossing off a real to-do list as you can get! How do you like to keep yourself organized in this digital age? Go ahead and shoot me a message or comment below! Parts of speech are one of my favorite things to teach. It might seem mundane to most people, but it reminds me of when I was younger and learning about nouns, verbs, adjectives, etc. I had a very organized notebook with information about each part of speech in individual sections with very neat headings and labels. I've always been a big fan of rules and organized notes, so I guess teaching parts of speech just takes me to that very organized place (you know, before I knew the truth about the English language and how it doesn't really always follow its own rules... ha ha!). I have just begun a new product line of task cards. 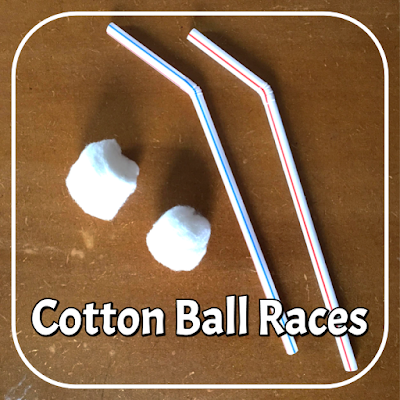 I've always used them in the classroom, but I always created them on the fly for whatever lesson I was doing at the time. In short, they've never been "up to snuff" for what I'd consider publishing. I've decided to change that. I've been revisiting the sets I've created for my own students and have begun revamping each set. Although I started with a counting coins set, I have become pretty well immersed in ELA in the past couple of days. 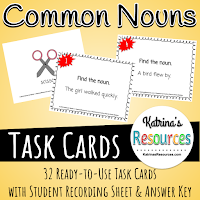 I've even posted a set of common nouns task cards just this evening! Over the next couple of weeks, I'm hoping to get at least one pack of task cards for each part of speech finished and posted. (When I mention it to more than just myself and my to-do list, I think it ends up getting done faster!) So hold me to it! I hope you have a wonderful Monday tomorrow! P.S. 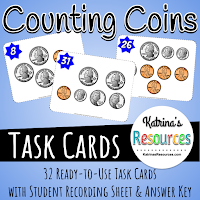 Interested in those task card sets I talked about? 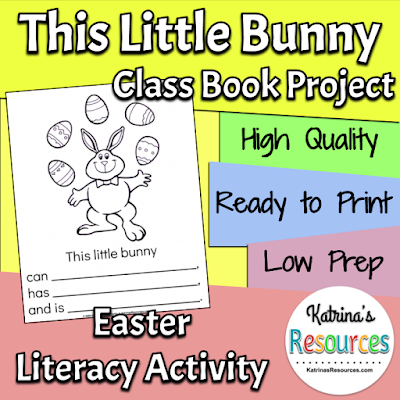 Check them out on my Task Cards page or click on the images below! I have spent the afternoon watching Life Itself on Prime Video and snuggling with this adorable baby boy. We’re both still dealing with a pesky cold and relaxing while big brother Cam is napping has been just what the doctor ordered! Sometimes when I’m relaxing, I feel like a total bum and my mind races with all of the things I know I could be doing instead... I could wash the dishes in the sink, tackle the basket of laundry in the basement, or finish the set of task cards I’m in the middle of designing... But today, I’ve just been enjoying my time with Tucker. And I can’t think of anything better or any place I’d rather be right now. How awesome is that feeling? I hope your Friday is just as lovely! You’ve heard of a wolf in sheep’s clothing... Today is a Thursday in Monday’s clothing! My hubby went back to work after being off for the holidays, so waking up with the boys this morning and getting back into our routine makes today feel like a total Monday. But really, we only have two days until it’s the weekend again... Woo hoo! If you’ve already returned to school, I hope your new year is back to a fabulous start! If you’re enjoying the last few days of your break, I hope you’re relaxing and don’t have too much prep to do before you head back! As for me, I’m just trying to stick with my big January goal of creating resources. Be on the lookout for some updated graphic organizers and new packs of task cards in the coming weeks! It's 2019! I hope everyone reading this is having a wonderful start to this new year. Even though I know I'm not a different person than I was yesterday, I always feel a sense of optimism at the start of each year. It's actually one of my favorite things about being a teacher, too, because I have the same "new year" feeling every fall when school starts. A new year can be a fresh start, a new beginning, and a time to reflect on what you're doing and what you'd like to change. For me, I'm looking on buckling down on creating a schedule for myself while I'm still home with Cam and Tuck. I have until April before I'm planning on returning to the classroom, so I'd love to use my time wisely. I know most of my days are not exactly "plannable" because I never know exactly when Tucker will need to nurse or Cameron will want a snack (my God, the snacks a toddler wants! ), but I can definitely set daily, weekly, and monthly goals for myself to accomplish. Sometimes I feel like I have so many different things I could be working on (creating products, making pins, recording for my Instagram story, listening to Podcasts, etc) that I end up overwhelmed and just bounce around from site to site without actually getting anything done. It's a great way to waste the little free time I have to myself! So, when I identified that problem, I decided to solve it... I've set up a nice little work space at my kitchen table so I can hop on my Chromebook whenever I have a free minute and be productive (those five-minute work sessions add up!). I also have a designated spot in the spare room upstairs where I can start to get work done on my desktop in silence when Nick is home or the boys are napping. I'm working on getting another table up there for photographing resources and organizing the tools I need to be creative. It might not sound like much, but it's the "preheating" process in my recipe for success... Now I just have to work on getting all the ingredients working together! My next step is writing out my goals so I can hang them on my fridge. That way, I'll see them every day whether I'm looking for them or not. I think just reading them daily will help me work toward achieving them! I made myself an organizer to keep track of my monthly and weekly goals. If you'd like to check it out and download it for free, click here or on the picture below. P.S. Speaking of preheating and ingredients (hmm, maybe I shouldn't have skipped lunch today), did anybody else get an Instant Pot or Air Fryer for Christmas? I received both from my awesome hubby and I legitimately have not turned on my stove or oven since. I'm having such a great time trying new recipes and cooking things quicker!